According to the Food and Agriculture Organization (FAO), livestock contributes to 40% of the global value of agricultural output. The abundance of livestock in the agricultural sector has created a demand for animal feed. However, there are times when there is a discernible dearth of nutrient supply for farm animals which becomes detrimental to their growth. This is leading to an augmented need for animal feed additives that are more often than not used as nutrient supplements in animal feed. 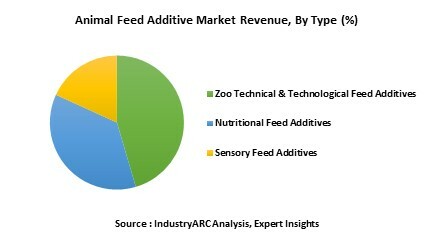 The flourishing animal feed additive market was valued to be $25,126 million as of 2018, and the demand for the same is poised to grow with a modest compound annual growth rate (CAGR) of 3.8% during the forecast period of 2019 to 2025. Owing to the population density in APAC and the catapulting demand for the livestock, the animal feed additive market is booming in the region. Furthermore, countries such as China, India, Indonesia, and others have a fairly large market share in the food and agricultural sector. There is also a palpable improvement in the production facilities and risk-management in the livestock sector that includes an increase in the production of animal feed which has opened a myriad of opportunities for the vendors that manufacture animal feed additives. APAC had a regional animal feed additive market share of 37% in 2018. Animal feed additives include vitamins, amino acids, fatty acids, and minerals. These animal feed additives not only provide the vital animal nutrition to the farm animals but also influence their presentation, hygiene, digestibility, and effect on the intestinal health, thereby producing better meat products for consumption. According to the recent statistics by PoultryHub, the global poultry production was gauged to be 111,000 thousand metric tons in 2015, and it is going to increase by 24% in the next decade that will translate to 131,255 thousand metric tons in 2025. Furthermore, it is projected to dominate the additional meat production market. Evidently, the future foresees propitious prospects in the poultry industry with a lot of scope for the vendors to boost their animal feed additive market revenue. The application of animal feed additives in the poultry segment is estimated to observe a CAGR of 4.5% through to 2025. An enormous number of animals suffice the nutritional needs of the world population. However, these animals are more often than not under-nourished and lack proper nutrition supply. This leads to a gamut of nutritional diseases that culminate to deaths of farm animals and the subsequent loss of the food sources. Evidently, the world observes massive food losses. FAO documents the yearly food losses to be one-third of the total food produced which is approximately 1.3 billion tons. This partly attributes to the loss of livestock that suffers from malnutrition. To ameliorate this, it has become imperative for farm owners to inculcate animal feed additives in the diet of livestock which is creating the animal feed additive market revenue avenue for the vendors. There has been a perceptible growth in the veterinary medicines and vaccines industry for some years now. According to a business intelligence report by IndustryARC, the veterinary vaccines market had a market size of $7.5 billion and is projected to grow with a CAGR of a healthy 8.2% through to 2025. Apparently, the veterinary medicines are ingrained with the animal feed additives in order to suffice the nutritional needs of animals which is significantly driving the animal feed additive market growth. There is a growing concern about the marbling score – a yardstick used to assess the quality of meat. This is largely attributed to the malnutrition in farm animals which is leading to a gamut of diseases, and is also having a subsequent effect on the quality of meat consumed by the population which in turn leads to chronic diseases in humans. With the world in dire need of reducing the people suffering from chronic diseases, there is a demand for good-quality meat which is achieved by fortifying the farm animals with nutrition, and that is prompting a demand influx in the animal feed additive market. Already, a large part of producers is using more than one feed additive. Using feed additives in combination is found to be more beneficial to the health of farm animals. This practice is poised to grow continually during the forecast period which will aid to prospects in the animal feed additive market. The producers will not be using data to check the health of livestock and what exactly needs to be done in order to produce the best quality meat. This will help them identify the kind of animal feed additives to include in the animal feed that can improve the quality of meat. In September 2018, Feed Additives Europe had conducted an industry event for the specialty feed additives. The organization is going to organize a similar event this year. This is not only going to spread awareness about the growing animal feed additive market but will also create a myriad of business opportunities for the attendees. The major challenge faced by the vendors in the animal feed additive market is the fact that some of the animal farm owners are compromising on the nutrition and managing with just maize, wheat, and barley without nutritional ingredients. This is significantly dwarfing the animal feed additive market size. However, there is a growing awareness about the health benefits of feed additives, which is sustaining to the demand. Another challenge is the veganism wave which is reducing the consumption of animal products and therefore, the demand for animal feed additives. Even though there are people who are opting for veganism, the meat demand is going to make up for a sustainable marketplace for the vendors. The key players crusading for the animal feed additive market share are Cargill, Incorporated, Chr. Hansen A/S, E. I. du Pont de Nemours and Company, Lallemand Inc., Lesaffre, Nebraska Cultures, Inc., Novozymes A/S, Novus, AFB International, and Alltech. The base year of the study is 2018, with forecast done up to 2025. The study presents a thorough analysis of the competitive landscape, taking into account the market shares of the leading companies. It also provides information on unit shipments. These provide the key market participants with the necessary business intelligence and help them understand the future of the animal feed additive market. The assessment includes the forecast, an overview of the competitive structure, the market shares of the competitors, as well as the market trends, market demands, market drivers, market challenges, and product analysis. The market drivers and restraints have been assessed to fathom their impact over the forecast period. This report further identifies the key opportunities for growth while also detailing the key challenges and possible threats. The key areas of focus include the specific applications of animal feed additives in farms, households, veterinarians, zoo, and animal shelters. The report analyses the product demand of animal feed additive market by species that include aquaculture, poultry, ruminants, swine, pets, and equine. It also analyses the market by the type of animal feed additive zoo technical additives, nutritional feed additives, sensory feed additives, coccidiostats and histomonostats, sugar based products, and direct fed microbial. Is the market demand for animal feed additive growing? How long will it continue to grow and at what rate? What is our Vision 2030 for the animal feed additive market?